Preheat oven to 175 degrees F.
Put egg whites in the bowl of an electric mixer. Beat with the whisk attachment until foamy. Gradually add the sugar to the egg whites. Mix on medium-high speed until stiff peaks form, 6 to 7 minutes. Stir in peppermint extract. Fit a pastry bag with a large opening star (2D) tip. Using a small paint brush, make 2 or 3 stripes of red gel food coloring inside the pastry bag. Fill the bag with some of the meringue. Put a dab of the meringue under each corner of the parchment on the baking sheets. This will prevent the paper from moving while you pipe the meringues onto it. Pipe 1-1/4 inch star shapes onto the prepared baking sheets. 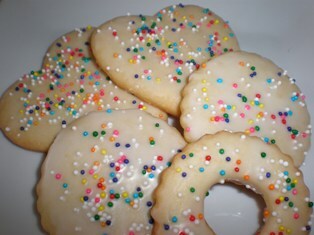 Sprinkle sanding sugar over the cookies before baking, if desired. Bake 1 hour and 40 minutes until the cookies are crisp but not browned. Cool completely on baking sheets on wire racks. After the meringues have completely cooled Melt 1/2 cup coarsely chopped bittersweet chocolate in a microwave until smooth. Dip the bottom of each meringue into the chocolate and place on a greased baking sheet. Allow the chocolate to set at room temperature or in the refrigerator. Meringue cookies are crisp and as light as air. 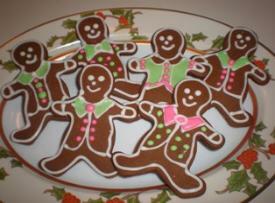 The candy-cane look is created by striping the pastry bag with red food coloring before adding the egg white mixture. 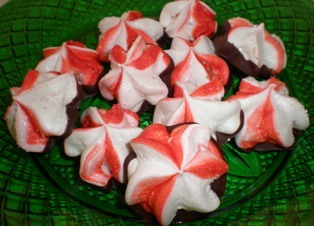 They can also be made with all one color by simply blending some food color into the egg whites. You can change the flavoring from peppermint to whatever flavor you prefer. This is a delicious gluten-free cookie. Many people prefer to use meringue powder or powdered egg whites in place of the raw egg whites because of the risk of salmonella when using raw egg whites and also for its ease of use. Meringue powder is a fine, white powder used to replace fresh egg whites and is made from dried egg whites and sometimes contains sugar, cornstarch and food gum. 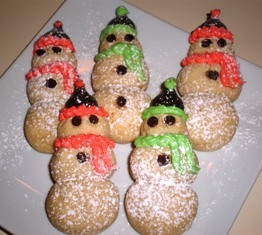 When beaten with water and confectioners sugar it has the same consistency as icing made with fresh egg whites.